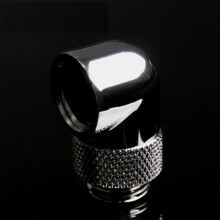 Rotary Fitting Adapter can rotate its spout full around (360°) so the 90° angle can be in precisely the direction needed. The smooth design reduces coolant flow restriction and the nickel plated brass construction provides durability, ensuring a long lifespan for the part. Click the button below to add the Barrow G1/4" Thread 90° Rotary Adapter (Silver) to your wish list.